UPDATE: Chalking It Up | News and Features | Style Weekly - Richmond, VA local news, arts, and events. Ralph White weighs in on Belle Isle chalk debate. 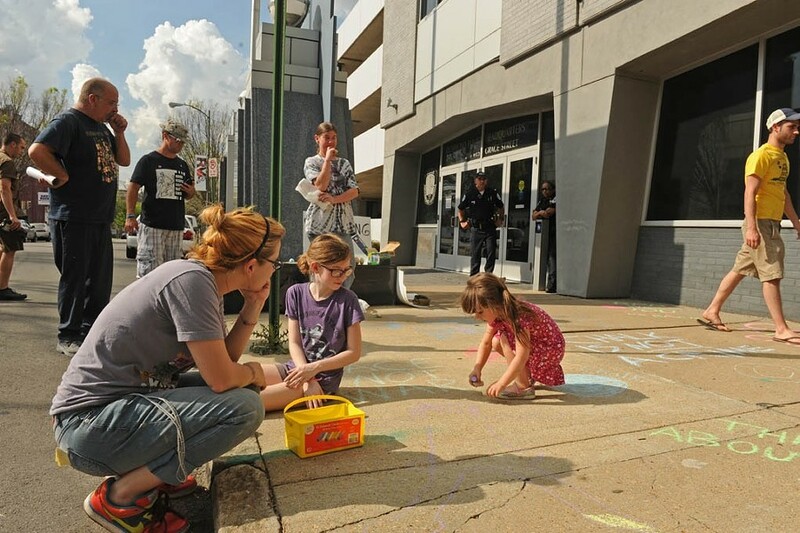 Susan Mortensen (left) watches her daughter Ava, 4, draw on the sidewalk outside police headquarters. "Hey troublemaker," calls out Nathan Cox, an activist with Virginia Cop Block. The troublemaker is Ava Mortensen, a 4-year-old girl with bright blue eyes, sequined shoes and a winsome smile. A week ago Ava's mother, Susan Mortensen, was ticketed by Richmond police and banned from public parks for allowing her daughter to draw on Belle Isle rocks with sidewalk chalk. "Ava, what were you drawing a picture of at the river?" her mother asks. "Butterflies and stars," Ava says. That wasn't it, Mortensen says. "She's been drawing doors to magic lands." In other words, "a rectangle with some scribbles in it." In 2010 Mortensen was charged with destruction of property for painting on rocks and fined $250. Ava's act made her a cause célèbre for Richmond's libertarians, occupiers and practiced protesters. On Friday afternoon a small group gathers in the parking lot across from police headquarters on Grace Street to prepare a sidewalk-chalk protest of their own. Protest organizer Meg McLain is a veteran of chalking protests -- apparently this is a thing now -- and similar demonstrations. In August she was arrested in Washington for selling lemonade. Earlier that year she participated in "a big dance party" at the Jefferson Memorial, where dancing, she says, is prohibited. "We continue pushing this message that chalk is not a crime, it's not a danger," McLain says. "It says 'nontoxic' on the box, and the worst you're going to have is some pictures on the ground that you don't like. Literally you can pee on it and it's gone." Police should be focused on more important things, she says. Ralph White, the manager of James River Park, says it doesn't matter if someone's using chalk or paint to deface nature: Either way, "it destroys the essence of what the park is set up for, which is an escape from the city in the city." Graffiti in the park is the worst it's been in 30 years, White says. Whether it's with paint or chalk, he says, "it's a problem we have to get rid of." And scrubbing chalk from rocks is more time-consuming than painting over graffiti on walls, he says. At police headquarters the protesters write supportive messages: "Smiles not fines. Chalk is not a crime. Kids having fun isn't illegal." Also: "Ron Paul 2012. The answer to 1984 is 1776. Hey cops Stop murdering people of color"
"What are you going to draw?" someone asks Ava. Protesters cover the sidewalk with drawings and slogans. Police power wash it off later that evening.